Let’s go back in time. It’s late October, and suddenly quiet around here, and the days are getting dark (earlier and earlier). In the kitchen, Katja is perusing catalogues, something she normally enjoys. Not so much, today. Because these aren’t the bright, glossy catalogues we get every day in the mail, tempting us to order some fun thing we don’t need. Welcome to the grim world of hotel/restaurant “catalogues.” Back in our inn-shopping days, an innkeeper told us that once you’re in the biz, you don’t pay retail anymore, you pay wholesale (for inn stuff, not your own shopping, alas). Yay! we thought. Little did we know that wholesale shopping for this stuff involves long phone conversations, red tape, and wading through these depressing tomes where, to add insult to injury, things were not necessarily cheap. Siobhan quickly bailed on this task. The glossy catalogues can barely hold her attention, but these were actually repellent: flat, two-dimensional photographs of things like white plastic trash buckets, 36 of them for $9.99 (!!) Or soft disposable plastic cups, individually wrapped, a case of 1000 for $25.95 if you order 20+ cases. They had a real Soviet feel. But somebody had to do this awful job and Katja, having already survived ice bucket shopping, took on the task. And so, one amazing day, actual samples of products began to arrive in the mail. Fun! Products to try! And here the village part of the story begins. Our friend Jan was visiting from Nebraska, and she became part of the deliberation process (in the kitchen–where most of this story takes place, come to think of it), weighing in on two crucial questions. The first was, which product? We liked a couple of the product lines but we ditched one after Jan sniffed it and pronounced it flowery; too feminine-smelling for men, something her partner would not use for fear of smelling like a girl. 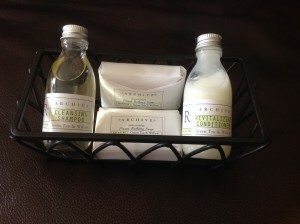 She favored Archive’s Green Tea and Willow line for it’s “clean” scent, and we agreed. One decision down. But another awaited: to order conditioner or not? 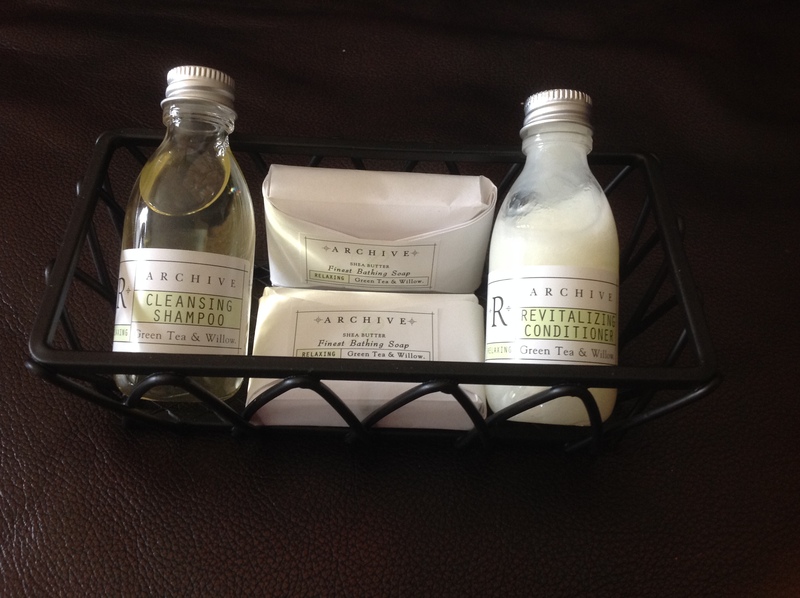 Our product offerings in the rooms used to be just shampoo + conditioner in one, and soap. Katja really wanted to order conditioner (of course the products we liked did not come in the two-in-one version), but Siobhan doubted if guests really needed/wanted it. Plus she was being cheap. Jan to the rescue again. 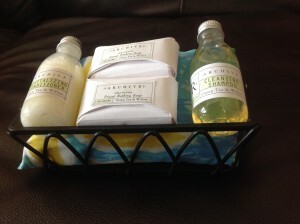 She said conditioner is the one thing people often forget to pack, that men use it too, and that in fact her partner and her son had gone out and bought it while traveling, if they had left theirs at home. We ordered conditioner. Our housekeepers had joined us in the sniff-and-vote fun, and liked our choice. But our head housekeeper Leah fretted about the potential waste. People won’t use all of that shampoo! she lamented. And the soaps, they’re so nice but…The first weekend we put the products out, Leah and Kendra filled half a jar with the leftover shampoo, to demonstrate how much was going to be wasted. Not knowing how to solve this problem, we shelved it for now, but stuck to our guns – after all, most other inns and hotels handle this issue somehow, and so would we. Jubiliation over choices made quickly faded as we realized the journey wasn’t over and that we were now embarked on Phase Two: the search for a product container/basket/what to actually put the shampoo, conditioner, and soap bars (very prettily wrapped) in. The old products had been placed on the ledge below the bathroom mirror. But these looked so nice; we wanted them to pop! So guess who had to head back to the Soviet-style catalogues? Yup. Phase Two involved a ruler and lots of discussion about heighth and depth of potential containers. But one glorious day, Katja found exactly the right thing–of course they weren’t cheap–and ordered them and eventually, several detours and shipping complications later, they arrived. They were cool looking: hooray! 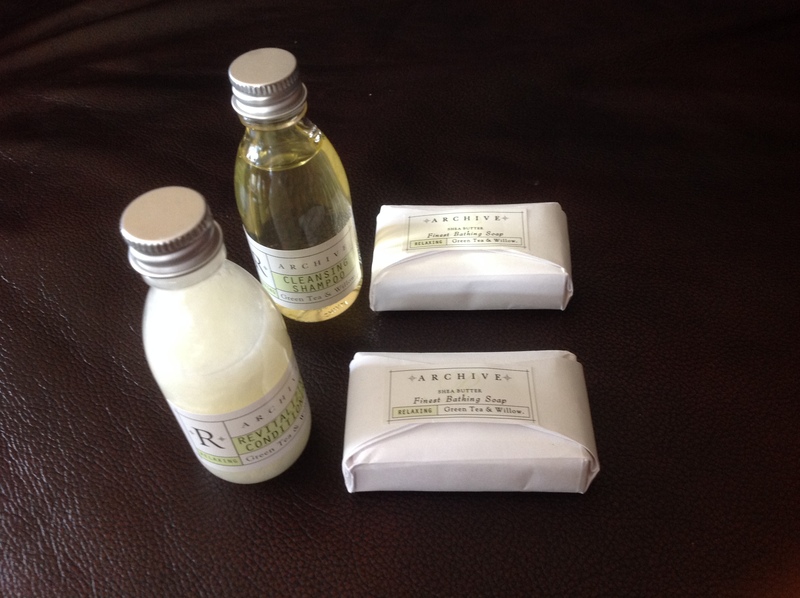 But wait…aren’t they a bit big for the two soaps, the shampoo, and the conditioner? We kidded ourselves for a while but finally had to face the fact that the products were rolling around in the metal baskets and needed something underneath them, to prop them up and show them off, as it were. And Katja knew the repellent catalogues had nothing like that. Now it’s January (remember, this saga began in late October). We took a one-night getaway to Portland and there, at a boutique hotel, we thought we’d found the solution. This hotel of course, also had very nice products in some kind of basket, and the products were nestled on top of…rolled up face-cloths. Genius! We were so excited; here was our solution, and a nice cheap solution too. As soon as we got home, Katja ran out to Reny’s and got two dozen face cloths in different colors (to match the product colors, of course). We rolled and folded and proudly showed the baskets to our housekeepers. Leah took one look and said, “People will use them.” Use what? we asked stupidly. She pulled a towel out. “They’re face cloths. People will pull them out and use them!” Well, we didn’t, in Portland, was our lame response. Here’s a big thing you learn as an innkeeper: to think about what might happen to the cute/fun/etc. thing you put in the room, when it’s in the room with guests, night after night. Hands up: who predicted that Leah turned out to be right? Yup. The morning “room report” routinely ended with “Room 3 / 7 / 12 used the face cloth in the basket.” Always said with a bit of a smile. But at this point, Leah became our most crucial “village person.” Because she now took this on as a problem to be solved. Leah is a brilliant fabric-worker: dresses, batiks, you name it. And she became determined to solve the product-basket problem, with a fabric-based solution. Morning after morning in the winter, Leah’s first words would be, “I have an idea…now what if we…?” Honestly at this point we had given up: let them use face towels was our default position (we had plenty). But Leah had got a hold of this idea and, we now learned, once she decided she would solve a problem, by gum she was gonna do it. And she did. The solution? 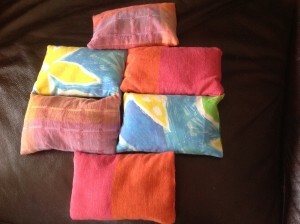 She would hand-sew little bags for each basket, using fabrics from her own collection, and fill them with….can you guess? Rice! Which she funneled into the bags (10+ pounds for 20 bags), creating a product-cushion that no one could possibly mistake for a face cloth. Though she did find one out in one of the bedrooms one day. We don’t want to know what that was about…but the bag was unharmed. Our final village person was Rick Wolf of the B&B Team, our friend and broker who, with his wife Jan, found us the Towne Motel. Rick stayed with us one night in April and of course he had to hear the Product Saga. And on the waste issue, he had a great tip about a company that takes unused shampoo and soaps from hotels and sanitizes them and then sends them to places in the world where cleaning products are in short supply. Solution! So now we’re collecting the leftovers and will be shipping them off soon. We have actually written 1400+ words about upgrading products. If you have read this far you deserve a medal. Come get it, and while you’re here, try our products! This entry was posted on Saturday, May 17th, 2014 at 3:33 pm and is filed under New Amenity. You can follow any responses to this entry through the RSS 2.0 feed. Both comments and pings are currently closed. 2 Responses to “Amenity Upgrade: or, It Takes a Village, Part 2” Comments are currently closed. Love your blogs. especially liked the Mary Tyler Moore reference! planning a trip to Maine in October and considering your motel. Hope to see you then.